JAMES Evans showed tremendous versatility in directing and acting; having to step into the role of Brutus at short notice and then creating a consistent and revealing side to the central character of the play. Evans’ production focuses on persuasive language and the semantics of power used to shape perceptions of reality. He did this in his own performance making Brutus a self-deceiving egotist with multi-faceted personality dimensions that perhaps I haven’t noticed in previous productions. His focus set the agenda for the whole production. Sara Zwangobani epitomised the power of persuasion in her nuanced and effective delivery of Mark Antony’s rousing “Friends Romans and Countrymen” oration. I doubt I have experienced it presented so powerfully either on stage or on screen. It worked brilliantly with Nate Edmondson’s music score and Anna Tregloan’s masterful set design while supported with some eerie ensemble movement work. This scene alone made the production worth a visit. This said, there were moments in the first half that had a recitation feel. While always clear and relatively easy to follow, I had the sense of actors on autopilot. There were the signature Bell slow-walks and freezes along with the Sydney-centric casual gear worn by the characters. Yet it took a while to see where the company was heading with the work. However, as momentum took over, this distancing of the action grew into a powerful motif. The minimal set and the delivery of lines utilised a considerable physical distance between actors while speaking to each other. This had the effect of isolating the words from the specific relationship between characters and emphasising the rhetorical. The interplay between Nick Simpson-Deeks’ impassioned Cassius and Evans’ Brutus was mostly conducted from opposite sides of the stage; emphasising the competing views of the two friends. Every objection or real viewpoint proposed by Cassius was smugly rebutted by Brutus. Yet the two came together like brothers reconciled at significant moments. The distance made the occasional proximity all the more powerful. The resolutions were achieved by rhetorical means. But Evans’ production is not about proximity. It deals with an isolation where power plays the dominant part. The human being and the polity are separated from themselves by the very language used to communicate. Even the act of assassination is shaped by the unreality of words as the verbal justification is written in blood on a billboard! 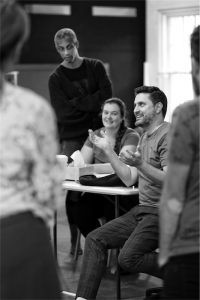 Bell Shakespeare’s “Julius Caesar” provides a prime focus on the nature of words, power and politics as demonstrated in today’s world while referencing historical events. It is both subtle and surreal while providing uncluttered supporting imagery and sound. Perhaps it needs encouragement to abandon some of the Bell Shakespeare signatures to more fully progress into deeper creative ways to express its very considerable insights and interpretations of Shakespeare’s brilliance and relevance.